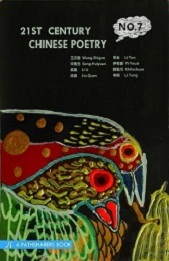 This issue features the poetry of Wang Zhiguo 王志国, Li Yun 李云（七月的海）, Song Huiyuan 宋惠元（柳思）, Yi Youxi 伊有喜, Li Li 离离, Chilechuan 敕勒川, Liu Quan 流泉, and Li Tong 李桐. messing up the earth’s pretty clothing. and all were little incidents. they have passed down the years. I love you too, up to a pound. and they can no longer stay full. followed by loud crackling noises. No matter what, he and I needed to talk. They have nothing to do with it anymore. it looks like a timeless flower. just like one tender little tree. Loose leaves fill the street but lose people’s attention. Seasons change. As for me, a woman making a living from the wind. It’s - - - Oh, Wind - - - truly you are my sustenance.